Finally it has happened, Amazon.in has launched their Apparels category. This was one category that many were hoping to be launched on Amazon India sooner rather than later. 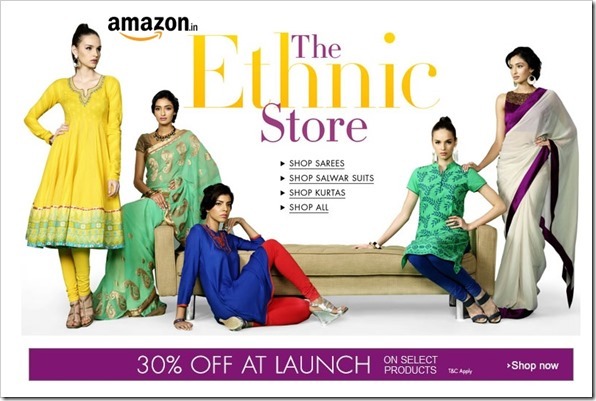 Amazon has entered Apparels category with the launch of ethnic and Indo-western wear for women. The new category has over 12,000 contemporary & traditional styles from over 90 apparel brands offered by private labels and national & regional retailers. Along with apparels launch, Amazon has also announced launch of Sunglasses section. With these 2 sections launching, they have now covered nearly every aspect of Lifestyle category which includes fashion jewellery, handbags, watches, beauty products and shoes. In 9 months since their launch, Amazon has gone from 3 main categories to 16 that includes Books, Music, Movies, Video Games, Mobiles & Tablets, Computer & Accessories, Cameras, Audio & Video, Home & Kitchen, Toys & baby products, Sports & fitness section, Beauty & health, Watches, Fashion Jewellery, handbags & Luggage, shoes & Apparels. Should Myntra & Other Apparel Stores Worry? Immediately No – but in the longer run, Amazon is sure to eat up a lot of market share. If the rumours about Myntra merging Flipkart turn out to be true, they will be in better position to fight Amazon’s aggression in Indian ecommerce space. However, it will be difficult for Myntra to compete with Amazon (in longer run) given the way they have progressed in less than a year. Whatever said and done, Amazon’s growth in India is going to be very good for Indian consumers. It will keep Indian incumbents on their toes. Just today the news came out that Amazon is piloting kirana store as pickup and delivery points. Such innovations augur well not only for consumers but other Indian ecommerce players as well (as they will need to keep innovating to keep pace with Amazon).